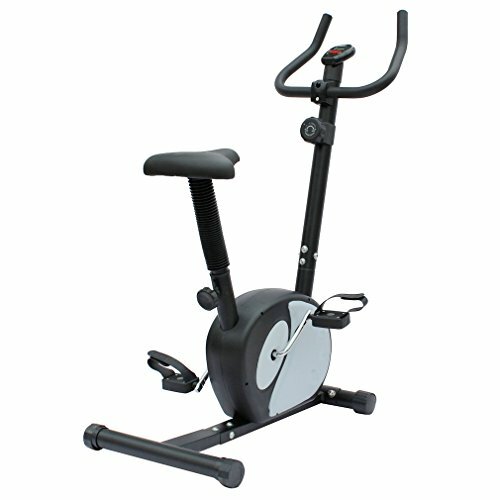 Build a fitter and healthier body right in the comfort of your home with Upright Exercise Bike from KLB Sport! Forget about gym memberships and save some cash by making your abode your new workout place. This exercise bike is designed to help you shed those extra pounds and build muscle by engaging in a full-body workout at home! - Multi resistance adjustment and seat vertical adjustable system. - Computer for scan, time, speed, distance, calories. - Sturdy frame and non-slip feet for safety and efficient. - Ideal for body exercise and body slim. - Great for use at home, office and gym. Hurrp up, and get one of the limited exercise bike now. LCD Screen--The exercise bike can display your Distance, Speed, Time and Calories，which makes it possible to see your results and you can shedule to take a break in time. Adjustable Seat Height--There are total 8 adjusting levels of our exercise bike seat height, ranged from 26"-34", which allows you to get comfort for different body figures. Adjustable Resistance--Magnetic Tension control system allows the user to adjust the tension level for an easier or more difficult workout. Safe Pedals & Foot Straps--Large pedal design with safety strap prevents any foot slippage when exercising. Overall Dimensions--29.5"(l) x 18.5"(W) x 40"(H); Weight Capacity: 220 lbs. If you have any questions about this product by KLB Sport, contact us by completing and submitting the form below. If you are looking for a specif part number, please include it with your message.